Laboratory table-top instrument for photonic process control. Two-channel measurement and control module for control and automation of irradiation processes. Three programmable relays (banana sockets) for automation of single and multi stage irradiation processes. 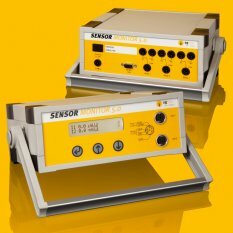 The two channel Photonic Sensor Monitor is used in photonic laboratories. It reads sensor signals generated by photodiodes as well as signals from amplified probes (0…2.5V). The unit displays the calibrated intensity values and calculates radiation doses. The included PC software SensorView 1.2 allows data logging and computer based scientific data analysis. Accessories are two sensor cables and a power supply (110…220V). NIST or PTB calibrated sensor inputs are available on request. The unit is also available as a compact OEM module for industrial use.